Puppies can’t take off their fur when the summertime heats gets intense. And as babies, they're still learning how to regulate their body's temperature when it's hot. So, it's up to their responsible caretaker to keep them comfortable on hot summer days. Letting your puppy chill inside in the air conditioning is one option for keeping him cool. But for puppies that spend most of their time outside, owners need to create an environment conducive to cooling down. Outside puppies need a shady spot to snooze. If you don’t have a shade tree in your backyard, an outdoor patio umbrella or sunshade canopy that covers a portion of your dog run will work just as well. Puppies can also find shelter in a ventilated dog crate or doghouse with ample airflow. Providing several options will teach it where to go when the temperature in its body rises. Cold water aids in the evaporative process that happens when a dog pants. It's one of the main ways that puppies, and dogs, regulate their temperature. But playful puppies may dump out the water bowl, leading to serious problems. To avoid this mishap, dig a bucket-sized hole in the ground and fit a watering pail inside. This way, your puppy can't tip it over. The surrounding soil also helps insulate the water, keeping it cooler for longer. Purchase a water faucet attachment and turn your hose bib into a puppy water fountain. Specialized attachments like the Lixit Faucet allow your puppy water on demand. Train him to activate the drinking fountain before leaving him by itself, and make sure it's strong enough to apply the pressure needed to activate it while you're gone. Fill your puppy’s favorite rubber chew toy with soft food blended with chicken broth or water. Then, stick it in the freezer. Offer these “pupsicle” treats to help your dog stay cool. You can make cool treats for hot pups with yogurt concoctions and baby food, too. And, chilled treats also alleviate the puppy pains of teething. Misting fans made especially for pets spew water into the air and lower your puppy's body temperature by keeping its fur damp. As the water evaporates, it cools your pup off. Misters can be placed on the porch, on the deck, or near a puppy playpen. Make sure the area your misting has a grass, wood, or a concrete surface. Watering bare ground can create a muddy mess. 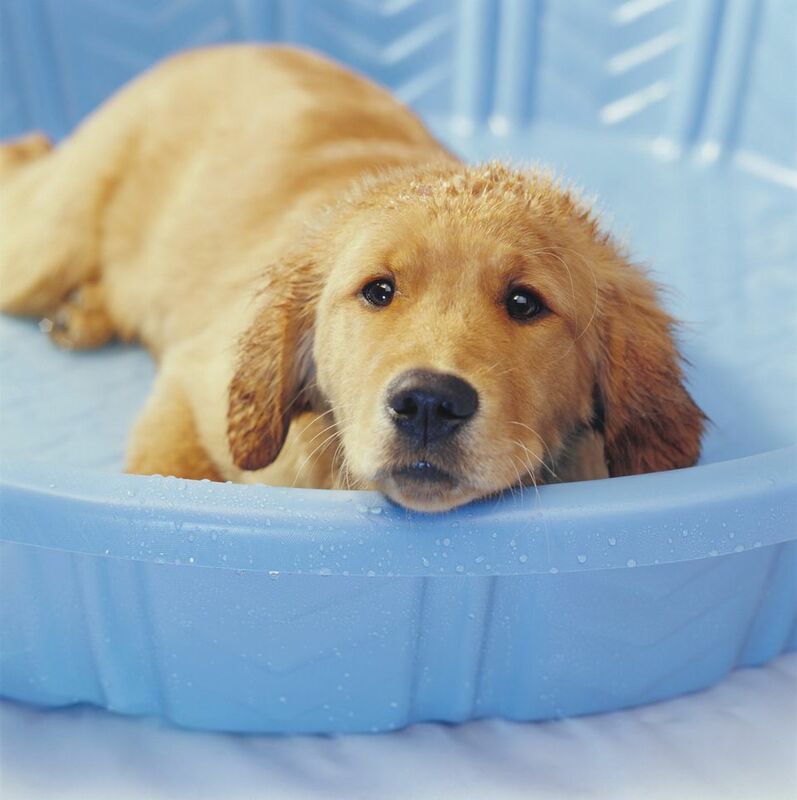 Set up a kiddie wading pool for your puppy’s splashing pleasure. Place it in the shade and invite a few doggie friends over. Use floating dog toys to entertain fetching retrievers and let your puppy learn water sports from the older dogs. To assure safety, keep the water level low and make sure your pup can climb out and won't drown if it's tired. Create a sandbox in a shaded corner of the yard for your puppy to stay cool. Puppies that love to dig might even excavate their own spot. Wet down the sand before you leave for work so that it can scoop out a comfy and cooling nest during the heat of the day. Sand creates a great medium for digging, as it's cleaner and easier to shake out of fur than dirt or wet mud. The same technology used to keep athletes cool and comfortable during hot weather also works for pets. You can find cooling bandanas, collars, ​jackets, and mats for indoor or outdoor use. Just soak them in water for evaporative cooling that lasts up to five hours. How Hot Is Too Hot For My Dog?